The top gas generated at the top of a distillation column in a petroleum refinery's fluid catalytic cracker (FCC) is used to produce gasoline and LPG. As the composition of this gas varies depending on the running conditions of the cracker as well as the composition of the crude oil, its density (= molecular weight) must be constantly monitored and measured. 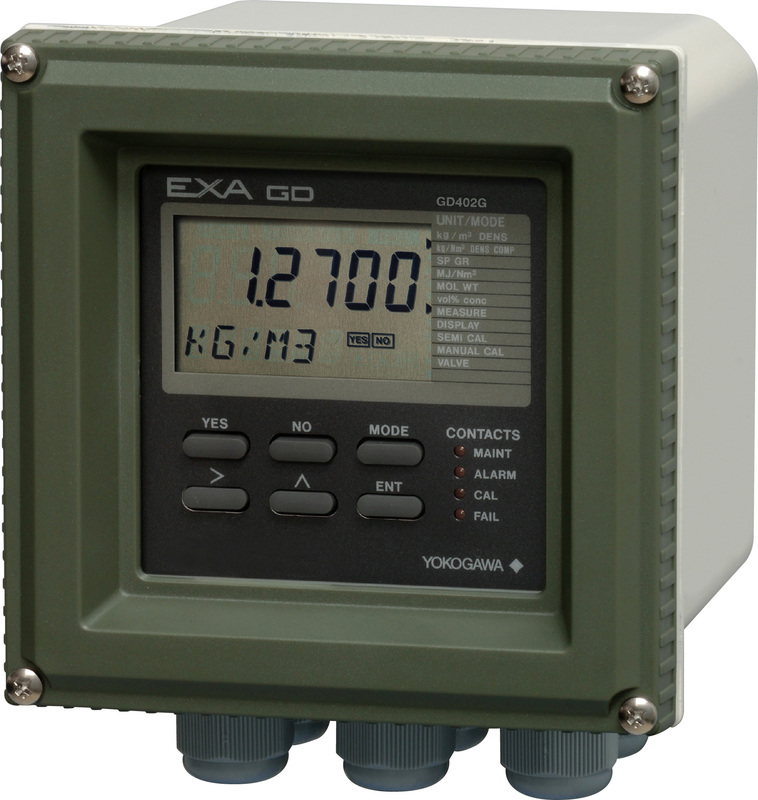 The GD402 Gas Density Meter has been introduced for this explosion protected application. It features an intrinsically safe and explosion-proof design, fast response, and a dust-proof, anti-corrosive, and flame-proof construction. In the petroleum refining system, an atmospheric distillation column or reduced-pressure distillation column is used to refine crude oil into gasoline, kerosene, and lubrication oil. In addition, the petroleum refining system incorporates an FCC to distill high-octane gasoline and LPG from the heavy contents of the crude oil. In many refineries the FCC unit serves as the primary unit, converting, or cracking low-value crude oil heavy ends into a variety of higher value, light products. The primary function of the FCC unit is to produce gasoline. Modern FCC units can process a wide variety of feedstock and can adjust operating conditions to maximize production of gasoline, middle distillate olefins (LCO) or light olefins to meet different market demands. The top gas generated in the fraction column of the FCC goes through a heat exchanger and is then pumped to a high pressure. The resulting gas content is transferred to the LPG recovery system and the liquid content to the gasoline generation system. In this process, it is important to measure the density (specific gravity) of the gas because the data is essential as a critical parameter in controlling the operation of the FCC. In addition to being used to monitor the system and the quality of the product, this measurement can also help prevent pump pressure surges. The GD402 Gas Density Meter has been introduced for this explosion protected application. It features an intrinsically safe and explosion-proof design, fast response, and a dust-proof, anti-corrosive, and flame-proof construction. GD402 will ensure stable and rapid measurement of gas density under hazardous conditions. It is capable of displaying specific gravity and molecular weight readings derived from the density data, and it will greatly reduce the workload by ensuring continuous and accurate measurement. The cubicles for the detector and converter are separated to prevent the gas in the sampling section from cooling and liquefying while the converter is operating. The capillary tubes for introducing the gas that is to be measured and the inside of the cubicles are heated with steam so that the heavy contents (C5 or more) will not liquefy. The GD40 detector is designed for intrinsically safe and flameproof, explosion protected applications. It is designed to be virtually maintenance free for all accepted applications.